Spoiler-free Synopsis: Christian, a citizen of the City of Destruction, is desperate to get rid of the mysterious Burden which is on his back and which will not leave him no matter what he does. Following the advice of a man named Evangelist, he begins a journey to the Celestial City. On the way he meets many characters and monsters, some as foes, some as friends, and still more as fellow travelers on the Way. Everyone is seeking something different and deals with the obstacles in different ways. Reason for Beginning: One of the most important books in the English language and in Christianity. Since I love English literature and am a Christian, I wanted to read this. Reason for Finishing: It was important to me to finish this. Although the style made it a sometimes slow read, ultimately it did engage and satisfy me. Story Re-readability: I’ll return to the story many times throughout my life, I’m sure – it’s just that kind of story. Not necessarily for pleasure reading, since the 17th-century’s writing style isn’t the easiest to decipher, and the lack of chapter breaks makes it difficult to put down and pick up again later. But the message is very important and more complex than it at first appears, so I’ll want to reread it to better understand the nuances. It’ll really teach you about what’s important in life, and how most people spend their lives pursuing vain things instead of doing what is right. You feel healthier after reading this book. 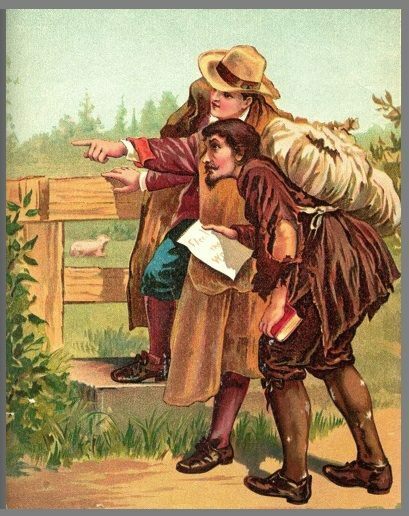 Author Re-readability: Most of what else Bunyan wrote is Christian theology and sermons, including an autobiography entitled Grace Abounding to the Chief of Sinners, although he did write a sequel to The Pilgrim’s Progress which is about Christian’s wife Christiana. Despite the 17th-century archaisms inherent in his language, he’s actually pretty simple and straightforward to read. He wasn’t a highly-educated aristocrat, but at turns a modest tinker, soldier, and preacher throughout his life. He got a decent education but was never upper class, and his language tends to be direct rather than florid. But DEFINITELY read a good annotated version, like Wiersbe’s. The margin-notes are invaluable to understanding the nuances of language and cultural and biblical references. Otherwise all but those highly educated in older English literature are likely to get lost pretty quickly. Recommendation: Yes, although it’s definitely a hard read for most modern readers, despite Bunyan’s comparatively direct and unadorned style. I’ll include a few examples below, so you can judge it for yourself. You’ll learn a lot about Protestant theology from this book, that’s for sure. It’s educational. And the characters are actually more developed than you might think upon starting it. Note: Illustrations are all from online sources. 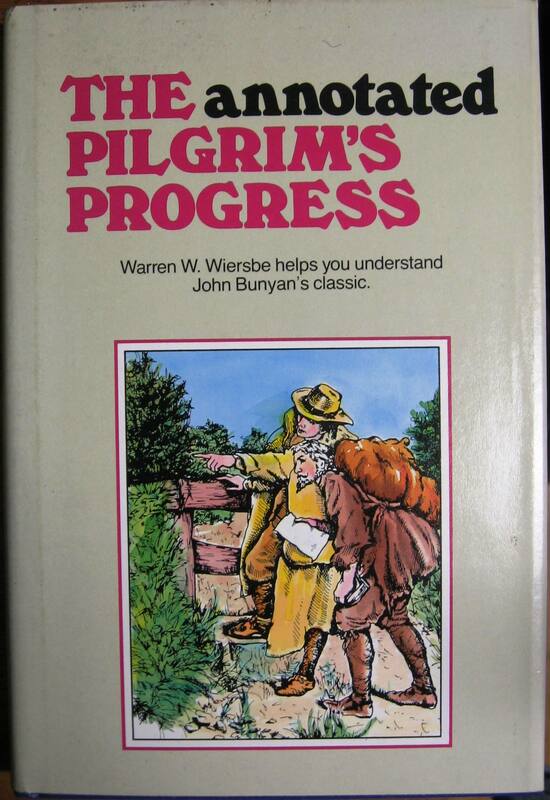 There are many illustrated versions of The Pilgrim’s Progress out there, but I didn’t have one. 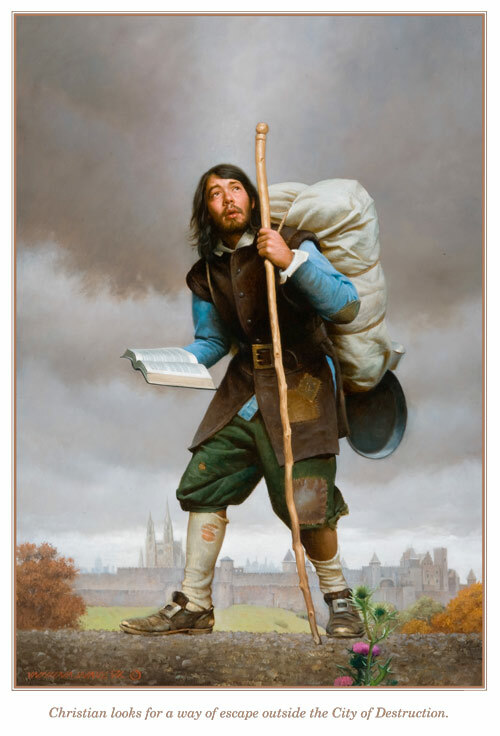 Christian struggles with his Burden, the Bible in hand. I’m not even going to try to discuss the vast wealth of scholarship that has been done on this book. Suffice to say that it is highly regarded as one of the English language’s Great Works, by people both religious and secular, scholarly and not. I wish I’d studied it at university, but I didn’t, and that’s that. First, the most important thing you must know about this book is that it is explicit Christian allegory, written to present the gospel in a different guise; not to confuse, of course, but that readers might recognize more fully the practical truth behind theological complexities. That is, the difficulties and struggles that every Christian will face in life, and the ultimate freedom and joy that they will experience in Christ. This is a book where being preachy is the very point of it, but it places the sermons in engaging stories with fairly interesting characters. Bunyan states his purpose quite clearly in an introductory poem, and really, with character names like Christian, Evangelist, and Worldly-Wiseman, and places like Doubting Castle and Vanity Fair, it’s hard to miss his meaning. It’s not even subtext, like in Lewis’ Narnia stories. Some readers might be put off by how overtly Protestant/Puritan it is, but I think this serves two good purposes, aside from the evangelistic one that I, as a Christian, approve of: 1) the book’s message and plot are well-focused towards a singular goal, and 2) if a non-believer wants to learn about biblical Christianity, this is probably the best book outside of the Bible itself. Christian is relieved of his Burden. Nearly every moral struggle we encounter in our lives is somehow allegorized, whether in Christian’s own journey or in encounters that others tell him about. Christian is tempted by “worldly-wisdom” and arrogance, by despair and doubt, while his friend Faithful must get past wanton lust, shame, and discontent. Every person has different strengths and weaknesses, and every Christian is encouraged by Bunyan to follow and study the Lord personally, and not compare oneself to other Christians, who have different experiences. I was a little surprised how the characters gradually acquired more development than I had expected. I mean, naturally I expected Christian to have a clear arc going from desperate, lost, and ignorant, to confident, wise, and loving. But there’s more nuance than just that. Just as Christians (as any human being) remain imperfect as they mature, so does our protagonist sometimes become too puffed up with the knowledge of his own betterment and become arrogant or impatient with others. He doesn’t become some irritating goody two-shoes as his journey towards Heaven progresses, but rather he learns moral truths the hard way, by making mistakes and getting called out for them. Take this exchange between Christian and his companion Hopeful, nearing the end of the story. Christian is telling the story of a man named Little-faith (a very important story, actually), who was beaten and robbed, and forgot about the jewels of Heaven (i.e. promises of God) he had in his pockets, but never lost the certificate that guarantees him entrance into the Celestial City. Hopeful keeps interrupting the story with relevant questions, and eventually Christian gets annoyed and sharply puts him down. Hope. : But ‘tis a wonder that his [Little-faith’s] necessity did not put him upon selling or pawning some of his jewels, that he might have therewith to relieve himself in his journey. Chr. : Thou talkest like one upon whose head is the shell [that is, like a baby bird just out of the shell] to this very day; for what should he pawn them, or to whom should he sell them? In all that country where he was robbed his jewels were not accounted of; nor did he want that relief which could from thence be administered to him. 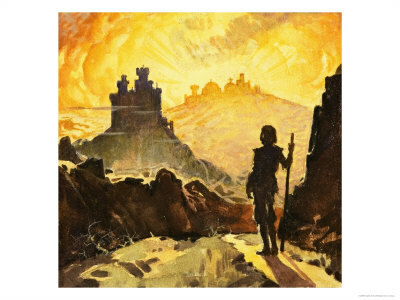 Besides, had his jewels been missing at the gate of the Celestial City, he had (and that he knew well enough) been excluded from an inheritance there; and that would have been worse to him than the appearance and villainy of ten thousand thieves. Hope. : Why art thou so tart, my brother? Esau sold his birthright, and that for a mess of pottage [Hebrews 12:16], and that birthright was his greatest jewel; and if he, why might not Little-faith do so too? Chr. : [he explains the difference between Esau’s birthright and Little-faith’s jewels]…Here therefore, my brother, is thy mistake. Hope. : I acknowledge it; but yet your severe reflection had almost made me angry. Notice Hopeful’s responses: he directly confronts his friend, but in a gentle manner. Christian remains rather insensitive in this scene, but Hopeful does not become combative and demand an apology. Rather, his manner is forgiving, and he gracefully lets the conversation move away from their conflict and onto other matters. Later on, these kind of incidents become fewer as both men mature spiritually, but the message is clear that no one shall be perfect until fully in the presence of God. Evangelist points Christian towards the Gate that opens on the Way that leads to the Celestial City. It takes some discipline and determination to make it all the way through the book, but ultimately I did find the story itself engaging. The complexity of the pacing is really amazing to think of, really. Bunyan structured each allegorical incident along the way to correspond with the order in which most people encounter that struggle in their spiritual lives. Periods of rest appear after especially dire trials, whereas encouraging victories might be followed by particularly sneaky dangers. This lends a good ebb and flow to the story. The most difficult sections are the very long theological discussions between just two or three characters, in which there might be no action described for quite some time, just dialogue. They get very detailed and are likely to lose readers less familiar with Christian teachings (which sadly includes many modern Christians). This is why Warren Wiersebe’s notes are essential for the modern reader, I think. He deciphers most of the very difficult language and calls attention to important thematic elements in the text. He notes when Christian makes mistakes, he explains nearly every Scriptural reference, and he even breaks down into clearer language many of the long theological discussions the characters have. The most learned and well-read man I know, himself a brilliant theologian and treasured friend, has said that this really is the best annotated version of The Pilgrim’s Progress. It is recommended for all adult readers, religious or not. Christian glimpses the Celestial City from afar. Congrats on finishing the Wiersebe edition. For your 2nd time thru you might want to consider the Thomas Scott edition from the 19th century (no publication date listed in my copy) but Google books shows one edition from 1795 and another from 1827. Our mutual friend told me that Scott’s notes were even more instructive than Wiersebe’s so I searched out a copy on the Internet used book sellers’ sites and was fortunate to find one some years back. On some pages Scott’s “note” fills over half the page! Very helpful, and especially if 19th century prose is not hard for you to read. I also recommend to scholarly works by Roger Sharrock (Penguin Classics, 1965, 1987) and by W.R. Owens (Oxford World’s Classics, 1966, 2003) if you ever decide that you want to make up for the lack of study at the university! I was amazed at how much secular scholarly study has been given to Bunyan’s work over the years. 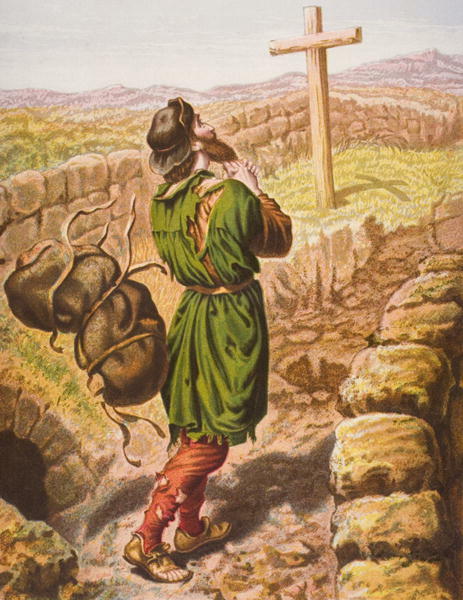 As far as understanding his allegory I was greatly helped by “Grace Abounding” and I think it’s my favorite work by John Bunyan. But as far as Christian allegories are concerned my very favorite is “The Two Wealthy Farmers” by Hannah More (Gospel Mission Press, 1981) for pure and transparent clarity in illustrating how the world fights against the Gospel and many good examples of how the believer might be able to explain & defend the Truth. I think you would really enjoy it. Thanks for the great review; I always hoped that more people would be made aware of Wiersebe’s great work and most helpful notes but we must be sure to specify the FIRST edition as they took out some of his notes (a significant number of them!) in later editions, much to my great disappointment! Thanks for the info. I’ll have to read More’s book sometime. Check them out & let me know what you think.